Also known as: USB extender, USB CAT5 UTP cable extension, USB booster, USB peripheral extender, USB active extension cable, extend USB device 150 feet via CAT5 network cable, USB over CAT5, USB balun, USB range extender. Extends One Self-Powered or Bus-Powered USB Device up to 150 Feet. Extend self-powered and/or bus-powered USB peripheral devices (security cameras, printer, scanner, keyboard, etc.). Compliant with USB 1.1 (low/full speed) specifications. One male USB Type A connector on attached 10-inch (254-millimeter) cable. Supports self-powered and/or bus-powered USB devices. Local unit: powered from attached computer. Remote unit: powered from local unit. USB port supports up to 400 mA current. Local unit: powered by CAT5 cable from remote unit. USB port supports full 500mA current. 150 feet (46 meters) over CAT5/5e/6 cable. Existing device cable with male Type A connector required. Use CAT5/5e/6 UTP straight through cable for TIA/EIA-568B wiring terminated with standard RJ45 connectors (not included). Extend CAT5/5e/6 up to 150 feet. Use of CAT6 cable may decrease the maximum length of extension. How to extend one USB device up to 150 Feet. 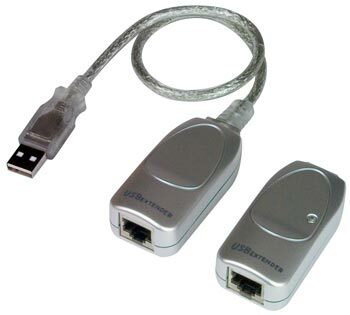 Use an XTENDEX KVM extender, ST-C5KVM-600, to extend the keyboard, monitor and mouse up to 600 feet, and an XTENDEX ST-C5-LC to extend the self-powered USB device up to 100 feet using CAT5 cable. "I just wanted to thank you for all of the help you gave me in ordering our USB-C5-LC extender and 150 feet of CAT5e cable. I really don't believe I have ever received such courteous, concern and friendly help in ordering anything. I will sing your praises to everyone I meet. Just so you know, I have moved our computer to the back of the auditorium and have run 150 feet of CAT5e cable to the pulpit, and the mouse works great!! Thank you!! You have a great product and no doubt a great company!" "Today I received a package from NTI Network Technologies Inc and I'm stunned at the amazing customer experience I found when I opened the box. They sent a personally signed thank you card. WOW!!! This is how you do customer service!! This is how you differentiate yourself from the competition. I love this so much... GREAT JOB NTI""
"I installed the USB-C5-LC USB Extenders in our Gift Shop. They work fantastic! I'd like to order another one for the other touch screen. I had to plug in the power supply for the USB Extenders to make it work. That's all it took! Just a little more power was all the touch screen needed." Indian Pueblo Cultural Center, Inc.
""I would like to thank your sales associate, Tammy Kuhn, for being incredibly helpful and for the amount of information that she has shared. Tammy has helped me close sales on the RACKMUX® KVM drawers and XTENDEX™ CAT5 extenders. NTI's cable prices and selection is also better than almost any other company I have worked with. I have told others about NTIs products and pricing and will continue to do so."